The Japanese charts seem to follow the patterns of many individuals from the Holiday season into a New Year. Festive excess and gorging makes way for a rapid retreat to the norm, with appetites slowed down to more reasonable levels. The latest Media Create charts show sales figures settling back to standard numbers, with a notable newcomer on the 3DS and some disappointment for the Wii U. To begin with software, the only new entry in the Media Create top 20 is also the number one, with Kirby: Triple Deluxe claiming the top spot with ease; the top five are all 3DS games. The top 20 is below, with lifetime (physical retail) sales in parenthesis. Hardware sales show significant declines across the board as the retail scene — unsurprisingly — drops away. The pattern does continue in terms of the 3DS remaining as the top-seller, though the Wii U drop has taken it below both Sony's Vita and the PS3. These are the Media Create results, which exclude the Wii's hardware sales. The Famitsu charts, which are often slightly different from Media Create's, do give a Wii figure of 382, for those interested. The latest Kirby adventure has succeeded in storming to number one, with its momentum in the coming weeks something to watch. These latest results do show hardware trends starting to revert to pre-December 2013 levels, which is good news for 3DS and less so for Wii U, at this stage. Just under Qtr mill sold aswell which is nice opening numbers. This game looks fantastic and I can't wait to play it. Have there been any non-Famitsu reviews of Kirby? I loved most of the DS and Wii games do I'm really looking forward to that. Poor Wii U, but most of us knew not to expect the Christmas sales to continue. There's always a huge spike, even in Japan. Nintendo have some huge decisions to make soon. Doomed again? I suppose 14k units is still far better than 3k from November and nearly 500,000 units for SM3DW seems pretty good for a title that had a poor opening week and only about 1.5M consoles to sell to. I wonder what the Japanese reaction to DKCTF will be. I can't see Nintendo getting anywhere in any region without Mario Kart. Handhelds dominate Japan, and the 3DS dominates Vita. Not really concerned with their console numbers. Nintendo has to win America and the UK. Japan should be an after thought. And when looking at Nintendo's marketing for the system, it is a major after thought. ehhh.......the holiday rush is over.....I'm not sure 14K is so bad all things considered.....but Nintendo needs to have a monthly release worth buying to keep things interesting for the Wii U. 3DS seems to be chugging along just fine. Donkey Kong Country Tropical Freeze! Don't delay it! Mario Kart 8 and Super Smash Bros 4 give us our release dates! Nintendo! please! It's noteworthy the resilience of Youkai Watch. I don't know what was initial shipment but at Level-5 have to be happy about its momentum after the disappointing first week results. Bad news for WiiU. I hoped it could hang on to 20.000 units this week. Let's hope that DK, MK8 and Smash have enough strength to save it from failure and guarantee some more worthy games. 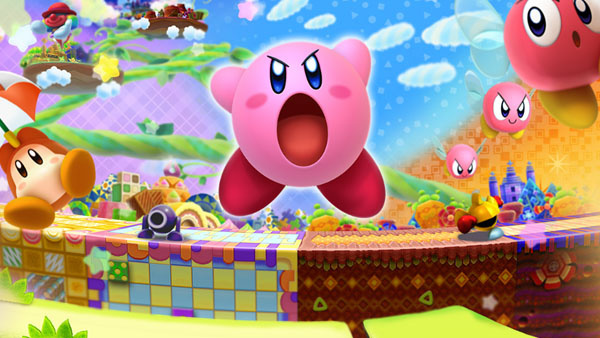 The launch sales figures for Kirby: Triple Deluxe actually aren't too shabby. It stinks that the Wii U dropped down to such low numbers again, but it was entirely expected. 14,000 is kind of a lot of consoles sold in a week considering it's after Christmas... Just trying to stay positive. 1- 3DS: Still the king of gaming consoles. I hope that it keep the same momentum. Games like Kirby: Triple Deluxe, and Puzzle and Dragons are extra reasons to own a 3DS. 2- Wii U: Holiday season was a temporary boost for the console, but after the season is over, it has started to become less interesting to the consumers. Nintendo, as far as I know, don't have new Wii U games for its homeland market for this month, and with the PS4 release date is around, Japanese consumers are probably holding their Wii U purchase. Sigh Wii U, well it was expected. Let's just hope doesn't go back to selling 5k or less each week as this past year, but considering that there would not be new games for the console until february with DKCTF then... yeah, probably this couple weeks would go back to 5k Damn it. At least it had a great holiday tough. And the 3DS... you doing it wonderful, you little stereoscopic awesome thing. The 3ds really is going some. Just need some of these games to come west even if its on e shop only. @ikki5 Actually, pre-November numbers were around 2k-5k units, so this is obviously much better. Still, the holiday momentum is obviously over, and Nintendo need to act yet again. Here's hoping for a big Direct this month, but I'm not holding my breath. Show those Europeans how it's done Japan!!! Kirby doing the usual. Poor Wii U.... And the 360 needs to go on the JPN Sales. So what? It's an awesome console with alot of great games. That's all I care about. I wish it well commercially but it's nothing to concern ourselves with really. Those thinking the wii u will be number one again.....plz stop. Those wishing nintendo would end the wii u just because it isn't number one.....plz stop. Those hoping to play upcoming 1st/2nd party wii u games, eshop games, and wii back catalogue games on their wii u in the next few years.....plz continue. 1st person shooter #203 on wii u, but that's why I will eventually add a ps4/xbox1 to my wii u. I just hope they don't fight next to each other on my console stand. Oh wait, they are inanimate objects, nm. It REALLY is something to concern ourselves with if you're the type of gamer that cares about more than just playing a handful of great Nintendo games and little else on your console. I think a truly satisfying consoles needs to be more than basically just a place for playing Nintendo's first party games. The very best consoles and most satisfying console experiences have always had BOTH great first party and third party support. I really don't get why so many FANS are letting Wii U get away with doing so badly in this particular area and indeed in so many other areas too. Don't get me wrong, I totally agree with you about its importance for Nintendo, and I'm 100% with you that more games make a better console. So we're in agreement there, make no mistake. But what I'm saying, is that is beyond our control. That's fate, if you will. It will sell what it sells, regardless if we sit here and worry ourselves sick about it or not. So why bother? See what I'm saying? I mean, Nintendo needs to do well financially for them to bring the most games also, but that doesn't mean I keep tabs on their finances. Nor do I care to. It's not "letting them get away" with anything. This whole Wii U sales thing is getting taken WAY too seriously. It's just a piece of plastic. That's all. One of many. Just a product for sale that provides a fun experience with great games, and Wii U certainly has a ton of great games. It sells what it sells, but worrying about it, or concerning ourselves with it, will change nothing. Pronouncing Wii U's commercial shortcomings benefits no one, and it has no bearing on our enjoyment of the console right now. Again, sure I want to see it sell well- I understand that will lead to more games (well, a few anyways- truth is Nintendo will NEVER see much AAA support due to the games not selling well enough on their platforms). I WANT all these good things for Wii U and Nintendo, just like you do. But I have no control over them, so why waste my time and effort complaining? And if I'm being really honest, I don't have many complaints. I bought my Wii U to enjoy many great games with unconventional methods. And to that extent, I'm very satisfied. There are 8 games that came to Wii U in its first year that I personally found more entertaining than most anything I'd played last gen. Some of my favorite franchises of all time have made a return or will be making a return soon, and I've had the pleasure of enjoying quite a few 3rd party games with the Gamepad advantage, which has been a nice filler to round out the library. I don't complain because I'm not dissatisfied. On the contrary, I think it's the funnest console I've ever owned in my life. That's not to say it couldn't be better, because of course it could. But sales are the least of my worries. All I know is I come home everyday and get to play any one of a number of excellent games on my Wii U. Even Wii Fit U, which I just got, is so utterly amazing to me! I never work out because it's boring, but with Wii Fit U I actually ran 4 miles, did the Luge racing and some yoga, as well as balance training, and my body feels like a creaky old board today! That Wii Fit U ain't no joke! And I love it for that. It mixes my love of interactive digital games with the natural rush of physical activity and endorphins. No where else can I play games that utilize the best of motion, dual screens and traditional twin analogues. Such diverse gaming like Pikmin 3, which was made for the Wiimote, to Wii Sports Club Golf (one of my all time faves) which uses second screen AND motion, which wouldn't even be close to possible on another platform, nor nearly as fun, to games like Wii Fit U, that actually work as well as any P90X workout (you get out what you put in), perhaps even better due to the fact it makes it alluring and fun. It's an amazingly diverse offering of experiences. Now, of course I'd like to see more 3rd party games, but, unless the Wii U is going to get ALL of them, I'm going to need a second console. And we all know, no matter how well it sells, it will never even come close to getting full 3rd party support. So the Wii U, even on its' best day, will always fall short when it comes to providing for our 3rd party needs. I bought a PS4 and I'm set for this gen. If more 3rd party games come, excellent, if not, that's fine too. Nintendo's games ALONE make the Wii U more appealing to me than all the 3rd party games in the world combined. Sorry for the long post, but I just wanted to fully express my opinion on the matter. It's not that I'm against good sales, or that I don't want good sales, or don't want more 3rd party games, it's just that none of those things have any bearing on my enjoyment of the Wii U, which is at maximum capacity right now! I love the sarcasm about not being able to play a new Madden game. Well done. Wii U's sales... (sign) can't say I wasn't prepared for this. Let's just hope they don't drop to 4 digit figures again. On the bright side, SM3DW is showing some pretty strong resilience, it'll hit 500K quite easily. Now Kirby, I didn't expect such a strong opening! Over twice as much as Mass Attack and Epic Yarn's first weeks. With such a strong showing in Japan already, the NA numbers (where Kirb normally does his best business) should be through the roof. You can announce the release date now, Ninty. Super excited for Kirby! Can't wait!